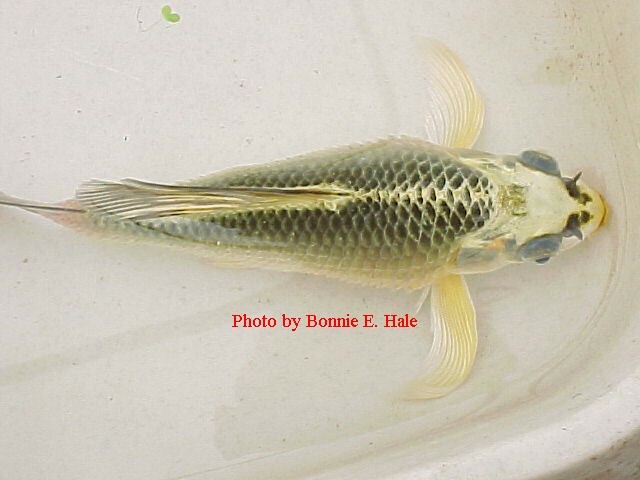 Dropsy is the most feared "disease" of the pond. Unless the Dropsy is caught in the very early stages, a cure is almost impossible. In this picture you can see the scales are standing out all over the fish from the head back to the tail fin. If you look at the body just above where the pectoral fins are it may be a little easier to see the scales sticking our much like a pine-cone. 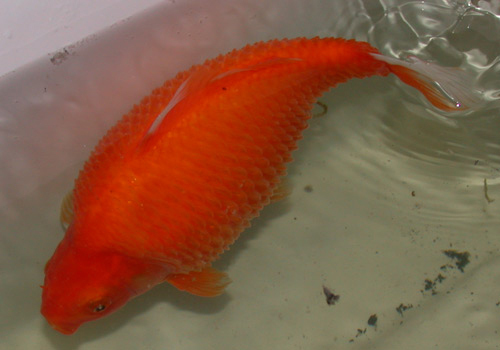 In this fish the eyes are also "popped". While this condition is not contagious and will generally not infect other fish in the pond, the conditions that CAUSED it are contagious. Those conditions could be/usually are contagious. The most common is parasites followed by bacterial infection. Keep in mind it is not the parasites that kill/injure the fish it is when the parasite breeches the skin (bites) the fish then the bacterial infection sets in. Pinecone/dropsy is usually the final stage of the bacterial infection. The fish actually bloats up from the tail all the way to the head because the kidneys have stopped functioning and the excess fluid has n place to go. This is when the eyes "pop", as the fluid has no place to go. What I find really peculiar is that I have seen an affected fish eat right up to a few minutes before it expired. The fact that the fish is eating usually gives the owner hope that the fish will survive. I will say I have tried to save many fish afflicted with dropsy, using many different methods but once the fish has a full-blown case of dropsy there is just no cure. Granted in the very early stages, cure is usually obtained by raising the temperature, adding salt and injections of antibiotics. The picture of the fish above was in the final stages and I could not save it.